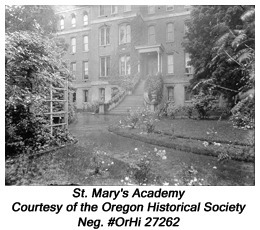 St. Mary's Academy was run by the Society of the Sisters of the Holy Names of Jesus and Mary. This school constitued a portion of the property on which the Supreme Court Case arguments were based. Opponents to the Compulsory Education Bill referred to it as the School Monopoly Bill. A group in Oregon, often called the Non-Sectarian and Protestant Schools Committee, circulated this pamphlet to encourage voters to oppose the bill. The group included statistics on the number of students in public and private schools, immigration, and literacy to support their arguments. Describe the economic cost that would result from passage of the Compulsory Education Bill. According to the author of this pamphlet, what are the fundamental differences between private and public schools? 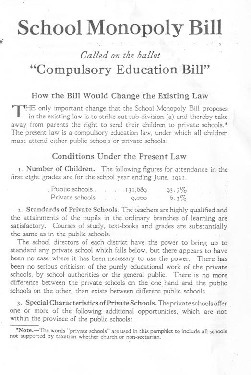 If you were an Oregon voter in 1922, would this pamphlet persuade you to vote against the Compulsory Education Bill? Explain why or why not. Suggest at least one way that this pamphlet could have been more convincing.